Doo rags are stupid, lets face it. No one could ever be taken seriously in doo rag in 2005, no one can be taken seriously in a doo rag in 2013, and in the future it's likely we'll look back at doo rags like some post-modern cranial loincloth where future people will think “haha, people used to put that on their heads.” But Chamillionaire didn't care – why should he, he's a millionaire with chameleon powers and mad rap hands, I wouldn't care either. Dropping in good old 2006 (the year Mozart enjoyed his 250th birthday) Ridin', often called Ridin' Dirty, hit the planet and shot to the top of many charts around the world, as well making Chamillionaire the first platinum ringtone selling artist ever. The song actually depicts quite serious afrocentric issues, but due to obvious stylistic choices as well as the guy saying “Playstation controller” when the video has an Xbox controller, it's so far from topical it's practically bottomical (geddit). That, and Weird Al Yankovic's parody of it became more popular than the original song, so yeah it's unserious. 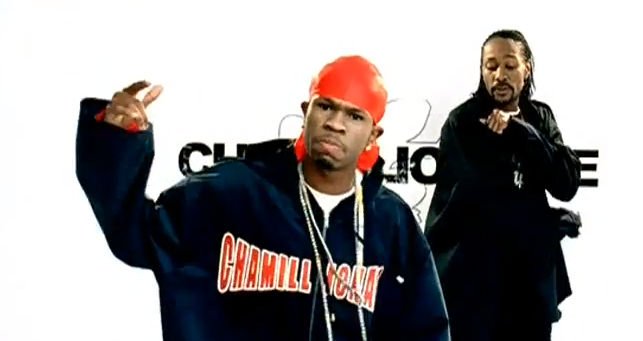 Anyway enjoy this week's #ThrowbackThursday selection, Ridin' by Chamillionaire and Krayzie Bone. And out of interest, does anyone know just how loud you have to play your music to “swang”?